Find the right tour for you through Lyon. We've got 410 tours going to Lyon, starting from just 4 days in length, and the longest tour is 46 days. The most popular month to go is June, which has the most number of tour departures. "I had fun but the pace was exhausting. The scenery was beautiful and the people were..."
"Wonderful trip. I am a vegetarian and i think trip should offer a vegetarian menu...."
"Wonderful crew, lovely ship. Loved the design of the rooms. I bought it with a set..."
"Hotels were fantastic and in the best location. Got to see all the major sights." 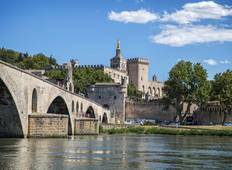 "Great way to see a broad cross section of France although it involved a lot of travelling..."
"Great tour with amazing sights - cathedrals and castles. Excellent Guide Pascal and..."
"I'm very happy with this choice of tour. We got to see many amazing parts of France..."
"The tour was well organized, great food, great hotels with the best tour guide."